Apple's latest update to their mobile software, iOS 7, is filled with interesting new features, including new message timestamps, Google Now-like results from Siri, Spotlight search from any screen, the new Control Center, Seasickness and Vertigo, increased.. Wait, Did you say Seasickness and VERTIGO?? Oh Yes. Change is always difficult, especially when you haven't innovated any real changes in the looks of your user interface in over 6 years. So Apple was bound to face some challenges from traditionalists who were resistant to change. But most of the changes were simply awesome improvements. But one that had critics, reviewers, technologists and early testers concerned was the new animations in iOS7. The zooming and parallax animations across the system have been a hot point since it's launch, with many consumers disliking the amount of "movement" going on when navigating around. One Apple user forum user named Ensorceled says: "The zoom animations ... are literally making me nauseous and giving me a headache," "It's exactly how I used to get car sick if I tried to read in the car." Other forum users are reporting feelings of illness, eye pain, and dizziness as well. It is worth noting, in Apple's defense here, that Apple does include an accessibility option called "Reduce Motion," the feature seems to primarily remove the shifting parallax effect seen on the homescreen. The problem though, according to users, is that the problem is not just on the Homescreen, the majority of users are pointing to the zooming effects that are now ubiquitous across iOS when opening and closing apps or entering the multitasking menu. 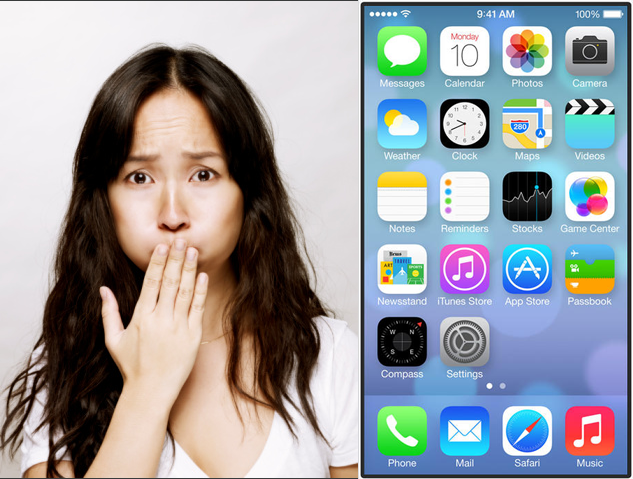 "I had to go home 'sick' from work because of the intense nausea due to using my iPhone with iOS 7." "I have the same problem. It hurts my eyes and makes me dizzy. Really unhappy with Apple on this one :-("
"Add me to the nauseous and headache list. Apple please give users the option to not have to look at it!" "I thought I was going crazy today after I updated my phone and I noticed I was feeling queasy every time I used it. Now I see I am not alone! I just used my phone for about 20 minutes and now I feel like I'm going to vomit." "I had severe vertigo the minute I started using my iPad with iOS 7," "Lost the rest of the day to it." Most of these customers commenting in Apple's forum state that they have called the company's support line only to be told that there was no way to fully disable the effects. Many say that they've resorted to downgrading their devices to iOS 6, which did animate the way that apps opened, but did so in a way that was quicker and didn't involve flying into or out of the screen. This is obviously a much larger issue than a few isolated incidents, and I am curious to see what Apple will say about the issue.